Nagpur: Activists and scientists, who are challenging the scientific basis, rigour, competence and integrity of the scientists who developed the Dhara Mustard Hybrid or DMH-11, have come out with proof of rigging of data, manipulations and blatant violation of recommended protocols and guidelines of the regulators, the Genetic Engineering Approval Committee (GEAC) and the Review Committee for Genetic Manipulation (RCGM). NEW DELHI: The Delhi University scientists led by former Vice Chancellor Deepak Pental notched up yield increases through transgenic mustard hybrid DMH-11 by around 7.5 percent through rigged research and development and testing, said a civil society group Monday. The Coalition for a GM-Free India also shared the raw data from field trials which shows that derived yield is completely at variance with yields reported by the Delhi University’s Centre for Genetic Manipulation of Crop Plants (CGCMP) and basic scientific understanding will clearly show that data is unbelievable in its possibility of natural occurrence. 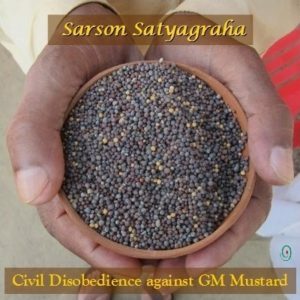 Under pressure from civil society, farmer groups and scientists, the environment ministry in February this year did not give permission for commercialization of GM Mustard and sought more details from developers. The Genetic Engineering Appraisal Committee (GEAC) under Environment Ministry met Monday to consider the pending decision on GM mustard and to take up fresh applications for research trials of new GM crops. GM mustard back on the table again? 4 Comments to "Six Points in Defense of Native Indian Mustard"
we don’t need GM crops. They are a harm to the environment and we being part of the environment it will harm us as well. please stop the Gm seeds in India and in the world.